Since the economic downturn of 2008, the continued financial difficulties Americans are experiencing seems to come as no surprise. Various government efforts, such as the expansion of safety-net programs, extended unemployment benefits and increased non-profit funding, have all been made in order to lower poverty rates. However, a recent study suggests that these measures may not constitute the entire answer to bringing more people out of poverty. In fact, in Indiana one researcher concludes that government may actually be inhibiting entrepreneurship and self-sufficiency. Noonan concludes that new entrepreneurial efforts to create micro-businesses will help lower poverty rates, but that certain factors in the state prevent this from happening. One of the points Noonan discusses in his study relates the consequences for micro-businesses that come as a result of the many various policies and regulations levied at small businesses. In a recent news release, Noonan uses the example of a food truck. He said that in order to operate a food truck in Marion County, your hours of operation are restricted, you need to get multiple permits, and you must provide two photographs of each employee. The sheer weight of so many regulations for micro-businesses like food trucks, landscaping services, and daycares effectively bars the poor from quickly and easily executing legitimate business ventures. 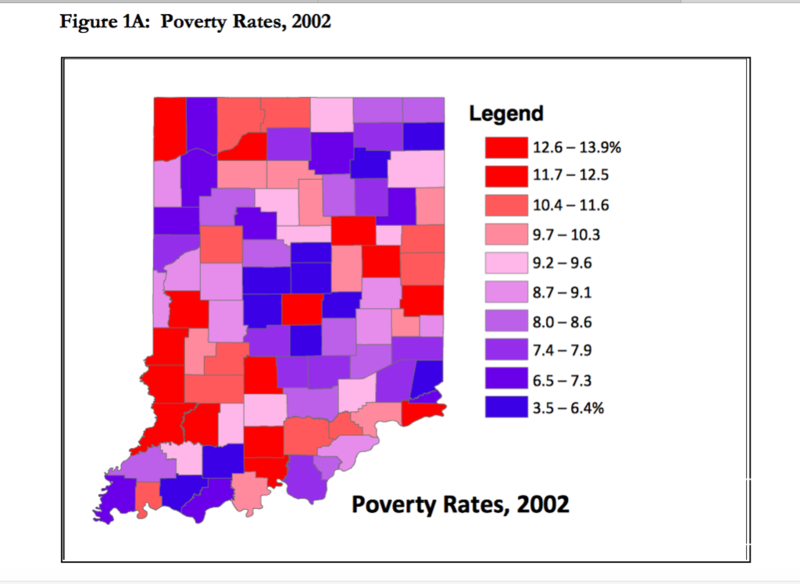 While certainly not the original intent of these regulations, the result may be the preservation of unnecessarily high poverty rates in some Indiana counties. Noonan also notes that low-income Hoosiers have almost no access to loans. Combined with the cost of starting a business, the lack of micro-lending prevents would-be entrepreneurs from getting the materials or equipment necessary to launch or accelerate the growth of their businesses. The inability to create legitimate self-sustaining enterprises creates a continued reliance on government safety-net programs and underground commerce – because sometimes taking advantage of state assistance is just easier and more financial sound than the navigating the regulatory and financial curve of entrepreneurship. Further, many underground business owners want to legitimatize their businesses, but quickly give up on that idea when faced with the high cost of doing so. Noonan concludes that poverty in Indiana can be reduced by opening a path for small micro-businesses through the reduction of regulations and an increase in micro-finance options.